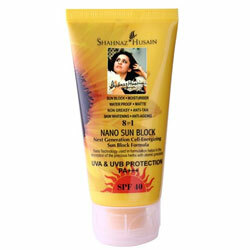 Based on highly advanced Nano Technology, this waterproof formulation, with high SPF of 40, provides broad spectrum sunblock protection from the Sun's UV rays. Containing natural moisturizers and sunblocks like shea butter, aloe vera, cucumber seeds, sunflower oil, zinc oxide and titanium di- oxide, it offers total protection from sun-damage nourishing and moisturizing the skin powerfully. It also provides anti-tan and skin whitening benefits, delaying the visible signs of ageing. Non-greasy and easily absorbed, it has a matte finish, leaving the skin soft and smooth, with a youthful glow.